Fishing Idaho's Salmon River "The River of No Return" Idaho's Salmon River "River of No Return"
Idaho's Salmon river "The River of No Return"
Few places in America, and nowhere outside of Alaska, provide a Wilderness experience to match the sheer magnitude of the Salmon River often referred as "River of No Return", the second largest unit of the National Wilderness Preservation System in the Lower 48 (second in size only to California's Death Valley Wilderness). This area combines the old Idaho Primitive Area, the Salmon River Breaks Primitive Area, territory on six national forests, and a small swath of land managed by the BLM. Senator Frank Church played a key role in the passage of the Wilderness Act of 1964, and his name was added to the Wilderness in 1984, shortly before his death. It is a land of clear rivers, deep canyons, and rugged mountains. Rich in the history of the west, this area was the winter home of the Nez Perce Indians, the haunt of early Chinese placer miners, and domicile to nineteenth century homesteaders and outlaws. This vast rugged area containing more than forty high mountain lakes, rises from 3,500' on the canyon bottoms of the famous Salmon and Middle Fork Rivers to over 10,000' on Mt. McGuire. Rainbows, cutthroats, graylings, and brook trout as well as the illusive golden trout abound in this area. The Main Salmon River, which runs west near the northern boundary; and the Middle Fork of the Salmon, which begins near the southern boundary and runs north for about 104 miles until it joins the Main. Reaching 6,300 feet from the river bottom, the canyon carved by the Main Salmon is deeper than most of the earth's canyons--including the Grand Canyon of the Colorado River--and this fast-moving waterway has been dubbed the River of No Return. 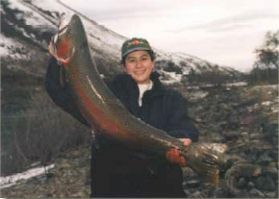 1999 "Women with Bait" Steelhead Derby Winner, from Riggins, Idaho. In the northeastern corner of the Wilderness, the Selway River flows north into the nearby Selway-Bitterroot Wilderness. Trout fishing usually rates from good to excellent. The Middle Fork, the Selway, and a portion of the Main Salmon are Wild and Scenic Rivers. Unlike the sheer walls of the Grand Canyon, these rivers rush below wooded ridges rising steeply toward the sky, beneath eroded bluffs and ragged, solitary crags. The Salmon River Mountains dominate the interior of the Wilderness. Without a major crest, these mountains splay out in a multitude of minor crests in all directions, and rise gradually to wide summits. East of the Middle Fork, the fabulous Bighorn Crags form a jagged series of summits, at least one topping 10,000 feet. The Bighorns surround 14 strikingly beautiful clearwater lakes. Hiking up from the rivers into the mountains brings sudden elevation changes. Great forests of Douglas fir and lodgepole pine cover much of the area, with spruce and fir higher up and ponderosa pine at lower altitudes. The forests are broken by grassy meadows and sun-washed, treeless slopes. 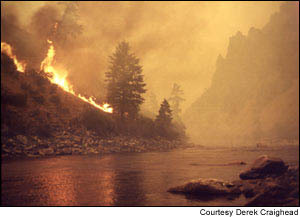 In 2000 Fires rampaged many areas of the Frank Church "River of No Return". A dry country, as little as 15 inches of precipitation falls near the rivers. As much as 50 inches may fall on the mountaintops, but much of it is snow. Despite the dryness, wildlife abounds. As many as 370 species have been identified in a single year, including eight big game animals. A network of 296 maintained trails (approximately 2,616 miles worth) provides access to this seemingly endless area, crossing rivers and streams on 114 bridges. This is a paradise for horse-packers. Thirty-two Forest Service Roads lead to 66 trailheads. Despite the extensive trail system, an amazing 1.5 million acres remains trail-free. Small planes are allowed to land on several primitive airstrips dating back to the days before Wilderness designation. Jet boats are allowed on the Main Salmon. © 2003 Angler Guide, All Rights Reserved.